Workshops: Better or Worse Than a Paid Pitch? It’s been common practice for a long time for an agency to kick off a new engagement with a workshop. Used this way, a workshop is a quasi-formalized method for the initial client download and perhaps some early shaping of the engagement’s next steps. Some firms have a tightly prescribed workshop format, and others are a bit looser, preferring to allow the day to go where it needs to. Either way, a workshop is typically part of a paid discovery process that begins after the agency is hired. Around 18 months ago, an agency principal was telling me about a new piece of business her firm was pursuing and she made the point of saying they weren’t pitching, but instead were getting paid to do a workshop as a means of exploring the fit. “So, they’re paying multiple firms to ‘workshop’ some ideas,” I asked. In this type of paid workshop you at least get the benefit of demonstrating to the client how you work. You also get to test drive the relationship to see how the two parties work together. Neither of these can you do in a pitch, where you’re working independently from the client and then presenting work developed under a variety of untested assumptions. Then there’s the obvious benefit of getting paid, which is not the norm for a pitch but does happen from time to time. The compensation for a workshop seems to be about what clients would pay for a pitch (for those that do pay for pitches). But whether it’s $10k or £50k, the amount paid for a pitch never comes close to fully compensating the agency for either the time invested or the value the solutions might generate. The costs of delivering a workshop tend to be far less than those of a pitch, because less preparation work is required, so here again the advantage goes to the paid workshop. When it comes to the value created, I suspect a workshop will generate far more actionable and valuable outcomes than a pitch. The standard outcome for winning a pitch is to throw out much of the work that won the pitch and then get down to practical ideas, whereas the collaborative nature of the workshop is more likely to create consensus on actionable outcomes. By all the measures above, a paid workshop seems to be better than a paid pitch. So workshops are better than free pitches and they’re even better than paid pitches but neither a workshop or a paid pitch creates an advantage for you—they simply help to defray your costs. If you cannot Win Without Pitching, try to derail the pitch. If you cannot derail the pitch, try to gain the advantage. If you cannot gain the advantage, walk away because your odds of winning are around 1/2n (with “n” being the number of firms participating). A workshop can be an effective tool for derailing the pitch or gaining the advantage when the client agrees to pay you for a workshop, but not your competitors. The tools for achieving Priorities 2 and 3 above are largely the same: ask for concessions, challenge assumptions, get the rules changed in your favour, get the client to agree to take an alternative next step with you, and only you. When you comply with the client’s selection process—whether that process includes a pitch or a workshop, paid or unpaid—you gain no information about how you are perceived relative to your competitors. It’s only when you push back and ask for behavioural concessions that you get a measure of how meaningfully different you are seen to be, how favoured or unfavored you are, and therefore how likely you are to win. 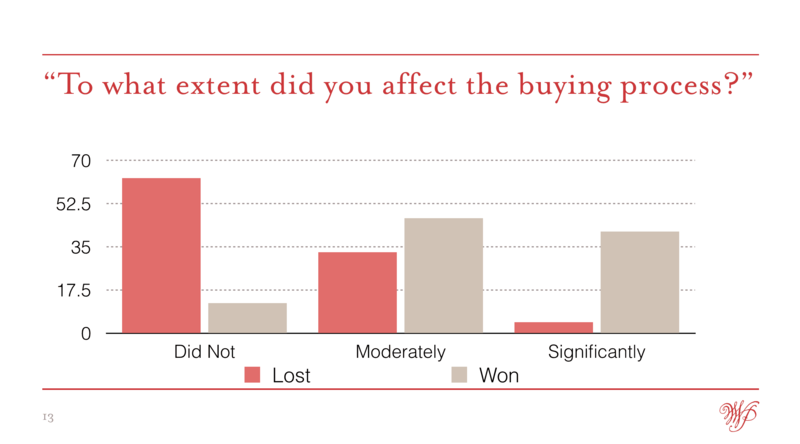 The survey data below from questions I submitted to RSW’s Agency New Business Survey in 2015 says it all: If you do not affect the buying process you are not likely to win. If you somewhat affect the buying process you are likely to win. If you significantly affect the buying process you are almost a lock to win. The only real advantage to complying with a client-driven paid workshop is that your high cost of sale becomes a little less high. That’s nice, but you’re far better off affecting the buying process through the pursuit of behavioural concessions because workshops on their own give you no advantage over your competitors. It’s still a level playing field until one of you tips the field in your favour. If it’s not you gaining the advantage by asking to be treated differently, you have to assume it’s someone else, and your odds of winning remain about 1/2n.